Gen Xtinct: "Welcome Back, Kotter"
Boy, those TV Land Awards are unleashing such a barrage of '70s and '80s TV stars on us, it's tough to keep up. The latest retro group to reunite: the Sweathogs. Gabe Kaplan, John Travolta (!) 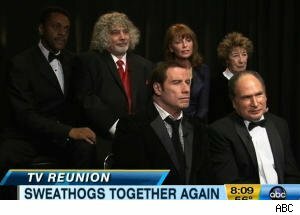 and four other cast members of "Welcome Back, Kotter" got together on Good Morning America on Monday. I've gotta say: It's always a blast to see these actors, many of whom haven't exactly been burning up the small or big screens with high-profile work. (We're talking to you, Epstein.) And it's especially cool when a breakout star like Travolta goes back to revisit his '70s roots. "Kotter" was always such a hoot. (OK, not so much when tight-pantsed Beau showed up in the final season. He was their Ted McGinley.) But the show had so many awesome moving parts, something was bound to elicit a laugh. From Woodman to Epstein's mother to Kotter's stories about his relatives to Carvelli, "Kotter" made it work. TV Land's got a great where-are-they-now? rundown of the cast. And if you think we won't be watching the TV Land Awards on Sunday, well, then up your nose with a rubber hose.